Away from their city home of Denpasar, Desa Apuan is a mountainside village with wonderful fresh air where Pak Wianta was born in 1949 and grew up. Home is a beautiful wooden house fully decorated with artworks of different series and periods of his artistic career with a beautiful garden nurtured by his landscape architect wife, Ibu Intan Kirana. Adjacent to his house is a large Hindu temple, Pura Luhur Natar Sari. Even as regular visitors to Bali, this visit provided participants with an immersive experience of Bali from art, cultural and recreational perspectives as we visited off the beaten tracks not always frequented by other tourists. A spread of Balinese delicacies including Ayam Betutu, fingers sandwiches and assorted pastries were served for the guests. More food like Italian pasta was prepared for the more picky eaters – junior guests who tagged along with their art loving parents. Red rice tea, a specialty tea from the neighboring Jatiluwih rice terrace, a UNESCO World Heritage and kopi Bali were served to compliment the delicious spread. 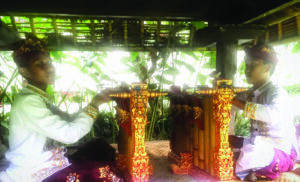 As if it wouldn’t be a uniquely Bali experience, two boys from the village performed Gamelan music in the sprawling garden to complete the fabulous afternoon. The Wianta family is truly hospitable. Pak Wianta met Ibu Intan, the grand daughter of Ki Hajar Dewantara, a pioneer in education from the Dutch colonial times and a National Hero, during his time in Yogyakarta whilst attending Yogya Premier art school, Institut Seni Rupa Indonesia. Blessed with two daughters, Buratwangi Wianta and Sanjiwani who completed their higher education in United States and Europe, they have returned to Bali to be closer to the family. Sanji has added the Wianta family from her marriage with Jonathan Nauleau, a grand daughter Louise whom Pak Wianta adored dearly. As you can see from the family picture, the Wiantas are a beautiful and gracious family. Without a doubt, Made Wianta is one of the most prolific and successful artists in Indonesia whose works are clearly not limited to oil on canvas painting but across multi disciplines and mediums including sharp items like razors, nail, shard of glass, kris daggers and hoes. Visiting his home and studios was a joy and privilege to participants, which led to a further discovery of the extensive achievements of this artist despite having seen his works in major platforms internationally. Unfortunately, Pak Wianta has not been well in the past couple of years following a motorbike collision. 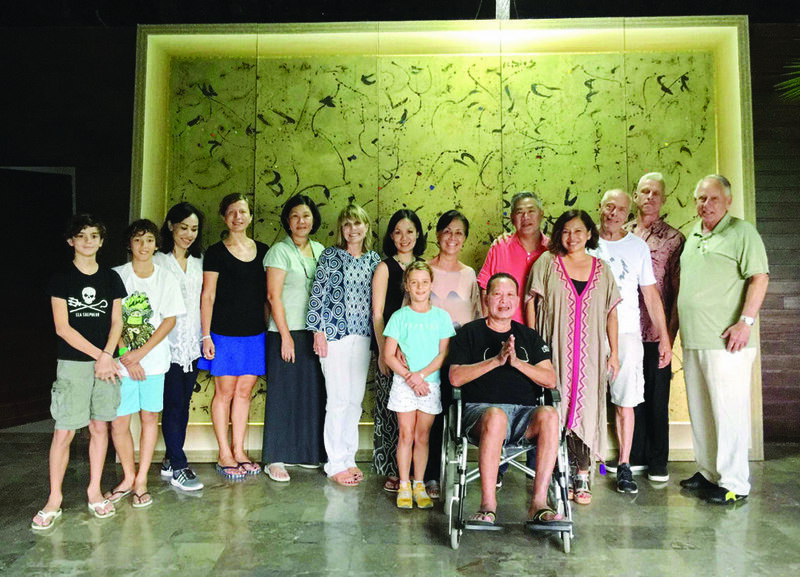 A long road to a complete recovery but thanks to ardent supporters such as Singapore Art Museum, Mizuma Gallery Singapore, Sofitel Nusa Dua Bali, Wesleyan University in New York, Consulate General RI in New York and private collectors, the family continues to manage his artistic career with shows happening in selected platforms in Bali, Surabaya, Jakarta, Singapore and New York during his illness. 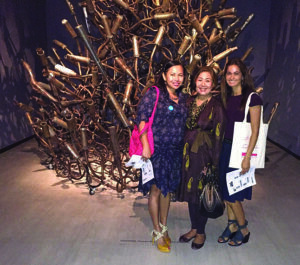 In his presence, our group gained insight into his artistic processes, ideas, range of mediums and material through explanation by his Management team, none other than his wife, Ibu Intan and daughter Buratwangi. Selected recent shows were part of the commemoration of 350th Anniversary of Breda Treaty in which the Dutch ceded Manhattan to the English in exchange for the tiny island of Run in Indonesia. The Consulate General of Republic of Indonesia in New York and Wesleyan University holds the show on April 2017. Worth noting is also the 2016 Singapore Biennale, an Atlas of Mirror where his work Treasure Island gained admiration from art lovers. Last year, Made Wianta was awarded Bali Mandara Parama Nugraha 2016 from Bali Governor, I Made Mangku Pastika for his dedication in promoting Bali through contemporary art. 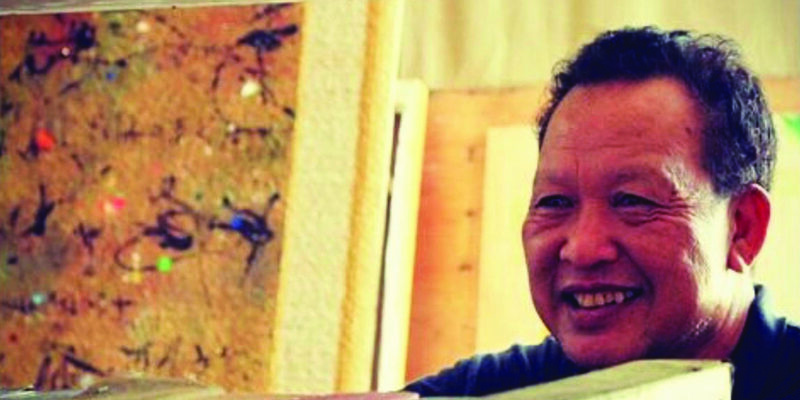 This award completes many other awards he received including Dharma Kusuma Award by the Bali Provincial Government (1999) for his strong sense of environmental awareness and social responsibility reflected in several art installations/happenings he created. The Most Admired Man of Decade from American Biographical Institute (ABI), Raleigh, North Carolina, USA was presented to him in 1997. 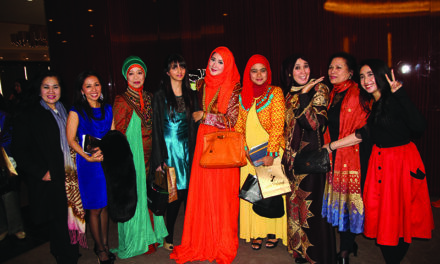 It was a memorable and pleasant afternoon for all attending this event, which was held especially to welcome our group. We will never forget the gracious and generous hospitality by the Wianta family and wish Pak Wianta a full recovery soon.